I’ll confess to not having watched the funeral yesterday, but, from what I’ve seen of the commentary and photos and a few videos, Tim Eagan has grasped an aspect, if not the main thrust, of the event. I like funerals, because grief eliminates a lot of inhibitions, and so you have not only laughter, but sweet moments like when W slipped Michelle a cough drop, harking back to an exchange at John McCain’s funeral. 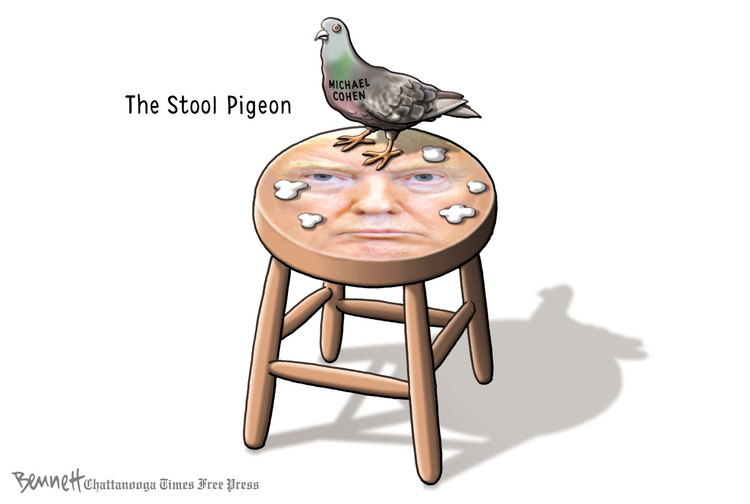 And there was Trump, sitting cross-armed and scowling. Granted, the Michelle Obama haters picked on her for her body language at Nelson Mandela’s memorial, and that wasn’t fair. But Trump has such a long history of being unable to connect with the moment that maybe the folly here is in bothering to point it out at all. 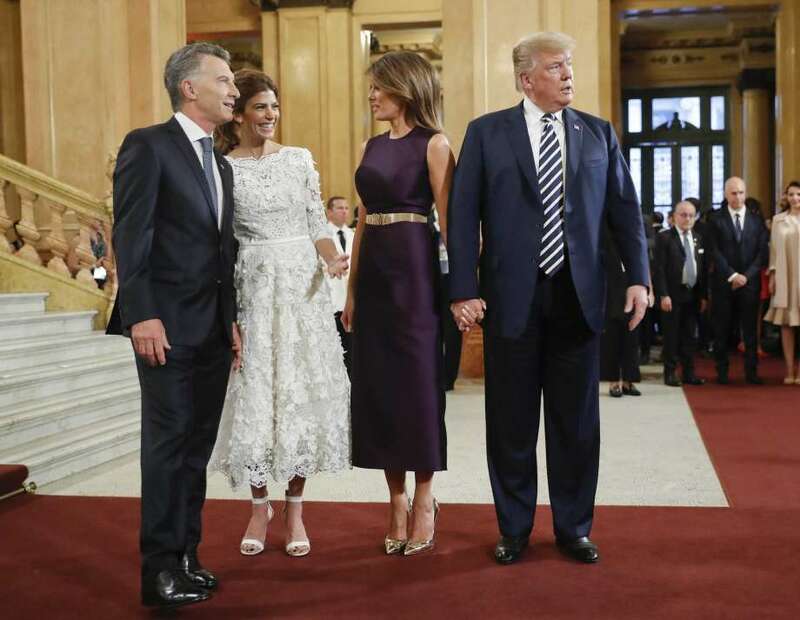 Take, for instance, this photo of him with the Argentine president and their wives, three of them chatting amiably and the fourth disengaged and distracted. He also wandered off before a group photo at the G20, and, at an early G-something, blundered past another head of state. Easy enough to say “The man ain’t got no couth,” but couth is pretty central to politics and to social skills in general, and most politicians learn to fake it if they haven’t got it. Can’t fault his sincerity, I guess. And continuing our theme of uncouth Republicans, Clay Jones notes the virulent attacks on Alexandria Ocasio-Cortez, and, in his essay, ties it into their hatred of other uppity women and minorities. 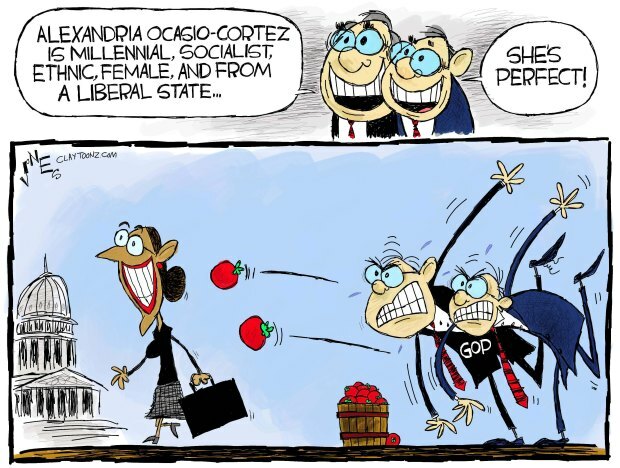 On one level, Ocasio-Cortez is the real-life embodiment of Judy Holliday in “Solid Gold Cadillac,” the working-class underdog whose lack of pretension and plain-spoken common sense win over the corrupt world, except that, in real life, the Powers That Be are not so easily defeated. So, as Clay points out, she’s getting the Nancy Pelosi/Elizabeth Warren treatment from the rightwing power structure and we’ll see how it works. But I have another thought about it, which is that my father once observed that, when he and his cohort came back from WWII, they were welcomed into corporate circles, but then they drew up the ladder and did not cultivate subsequent generations. The result, for the steel industry and several others, was an executive level made up entirely of people who were all going to retire in the early 1970s, with nobody groomed to replace them. Seeing this new group of Democratic legislators come in signals potential transition, not now, but for the future. Bernie, after all, is 77, Alexandria is 29. A couple of Elizabeth Warrens and Adam Schiffs and Kamala Harrises to fill in between’em and progressives may have a future after all. Of course, that assumes the Old Folks don’t spend too much time playing the “Al Gore lied” game, where you perpetuate cheap jokes at the expense of honest analysis. So Cory Booker is mocked for citing a popular “I’m willing to take the fall” meme, “I am Spartacus,” while Ocasio-Cortez, having pointed out the ease with which defense funds are budgeted without oversight, is accused with school-marmish exactitude, of getting the cost of universal health insurance wrong. As I’ve said before, let Pelosi take the abuse — she’s used to it — and hope the youngsters can get through intact. 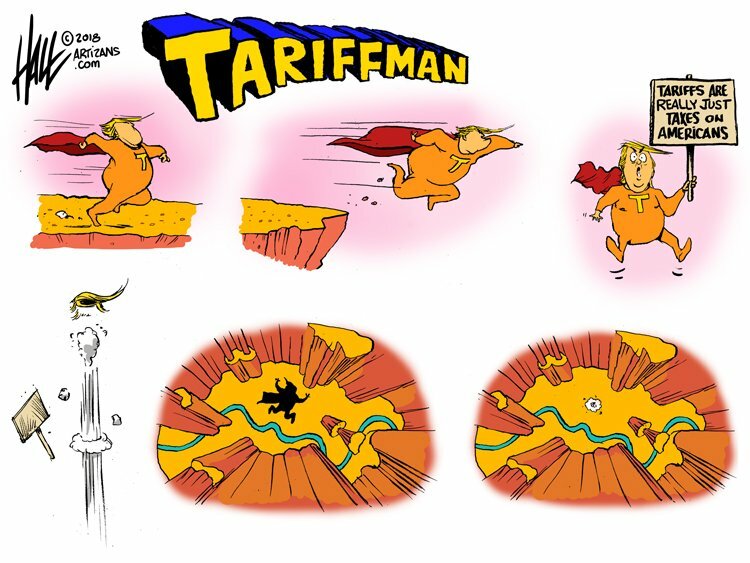 I’m disappointed in how cartoonists picked up on Dear Leader’s ridiculous “Tariff Man” tweet. A couple simply drew him as a fake superhero, a couple others tied it into some sort of Batman gag. Ed Hall, however, mashes in Trump’s absurd claims of genius, putting Tariff Man into the role of our least competent cartoon schlemiel, and thereby gets a chance not only to mock the personal pretension but to point out the logical flaw. Trump’s grasp of economics is equivalent to Wiley Coyote’s grasp of physics, the difference being that Trump’s college major should have taught him how these things work. Yet he thinks that China is paying the tariffs, when the money comes from American companies importing those goods, and he even gets “tariffs” and “interest rates” confused. 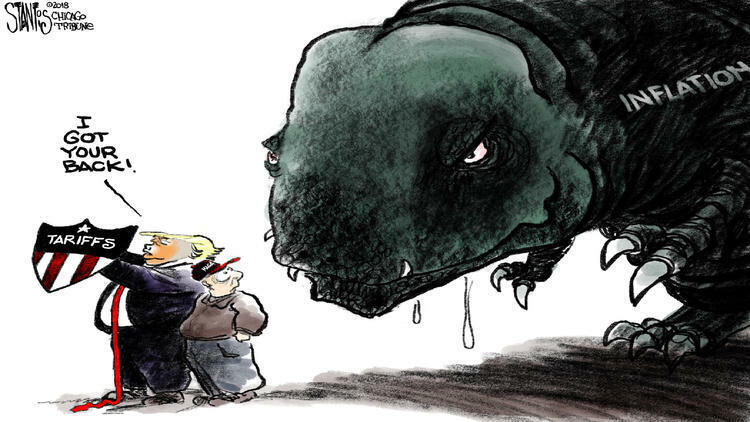 The result of his blundering, as Stantis notes, is that consumers are facing far more economic peril than he is protecting them from. This is more a juxtaposition of things that make me uncomfortable than anything else. 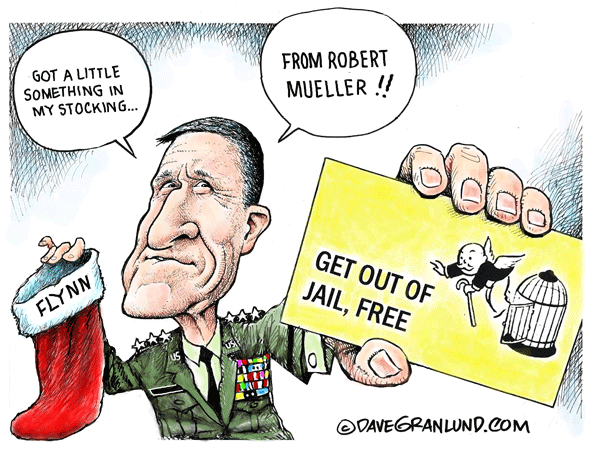 Knowing the general proclivities of both cartoonists, I don’t think either of them are condemning Cohen and Flynn for cooperating with Mueller, but both the “stool pigeon” and, to a slightly lesser extent, the “Get Out Of Jail Free” memes seem to me to carry a stigma. For every “Donnie Brasco” or “On the Waterfront,” there are 100 movies and TV shows where the fellow who goes to the cops is a coward, and even the police, for all that they take advantage of his information, hold him in contempt. I’m delighted these guys are testifying and I’m reasonably sure Bennett and Granlund are, too, but we sure live in a conflicted culture, don’t we? Wallace the Brave reminds me of a time in first grade when Sister left a kid as monitor and I committed some infraction for which he planned to report me. “What’s your name?” he demanded, and I told him. “How do you spell it?” he asked, and a light went on. When Sister returned, she took his list of malefactors and began to tell them all off and punish them, until she came to the name that was just a bunch of random letters. And he’d tattled on so many, he couldn’t remember who it was. I was a lousy student, but a quick learner. He didnt just blunder past a world leader; he elbowed his way to front and centre of the official photograph, and he got taken to task for it. No wonder he didnt bother showing up for this one: petulance is indeed his style. 28 queries in 0.185 seconds.